Pieh Tool offers periodic bladesmith classes with Ray Rybar in Camp Verde, Arizona. Classes are geared toward beginner to intermediate skill levels. Blacksmithing experience is recommended. Consider taking our beginning blacksmith class first. *All students enrolled in our classes may take advantage of store wide 10% discount on merchandise purchases made during the class session. Exclusions: Treadle Hammers, Fly Presses, Milwaukee Electric Power Tools, Jet Machinery & Equipment, Johnson Furnaces, Wilton equipment or any of the aforementioned accessories. Also excludes Classes, Gift Certificates and Sale items. Ray began forging blades in 1972 and joined the American Bladesmith Association in 1986. In 2001 he attained the coveted status of ABS Master. Ray works almost exclusively with patterned steel and enjoys crafting all types of knives. His favorites are long bladed and are frequently decorated with biblical passages. Ray, a contributor to Blade Magazine and a nationally known instructor. Take this rare opportunity to learn from a true artist and master craftsman! As an Artist blacksmith, I direct my primary effort to cutlery but not exclusively. I am most known for bold Damascus patterns, and more recently, near impossibly intricate mosaics. The Inspiration for my most sought after works comes from scripture and is centered on Biblical themes. I conduct my business under the premise that if art is your master, it will become your idol. If it is your servant, it will become your ministry. 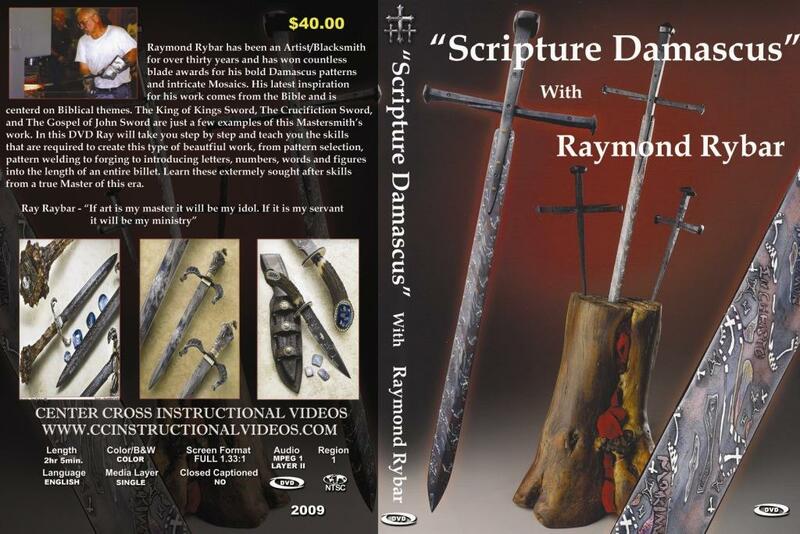 Click Here to order Ray's DVD! This course will emphasize the use of hand tools in the knife making process and will fit one handle; and if time permits, guards and ferrules. Each student will forge and finish at least one knife blade from 5160. His course covers proper fire procedures, blade forging of a stick and full tang and the integral bolster. This is a hands-on course but there will be a lecture on the structure and composition of the blade material. Decorative etching, file work, mosaic and damascus will also be discussed.